While I was visiting my brother, he mentioned that our grandfathers house had been auctioned for taxes. When I was a child my grandparents house was a safe haven. Home gave new meaning to the word “dysfunction.” During my early childhood my father was ill most of the time, he had a bad heart. My mother was rarely home. After my father died when I was four, any semblance of anything normal disappeared. Occasionally my grandparents would take me to their house for periods of time. Being with my grandparents was always care free, warm, and never a doubt of feeling secure and safe. The house was neat as a pin and Grampa had beautiful flower gardens, berry bushes, apple trees, and vegetables growing in the yard. The garage had a freezer that was always well stocked with ice cream. Gramma was a good old-fashioned cook. She fed us well with chicken and noodles, fried chicken, mashed potatoes, gravy and pies made from berries Grampa and I would pick , with a crust sprinkled thickly with sugar and baked to a crisp perfection. Grampa had a big swing in the back yard and we would sit in it together and drink ice tea and talk and he would tell me the same jokes over and over and I would laugh every time. The neighbor kids would catch toads and bring them to him and he paid them a dime for each one they released in his yard. He always said he thought he might be paying for the same toad every time. Sometimes they would pick up my cousin, Tina, to keep me company, but I preferred to keep them to myself and was always jealous of ANY attention they gave her when I was there. After Gramma died, Grampa hired various ladies to care for him. Often they were women in dire straits themselves and he provided them their own room, food, etc. and a small salary to do light housekeeping and cooking. He would take them to the grocery store to buy what ever they pleased and was not really demanding in any way of what they actually cooked or apparently how well they kept house either. At one point apparently his finances were short and he did not have the money to pay his property taxes and one of my uncles (Grampa’s stepson from my gramma’s 1st marriage) paid the taxes in exchange for title to the house, and Grampa had an agreement to lifetime occupancy. No one knew anything about this until Grampa was in the hospital and the “uncle” tried to evict him. My older brother and sister took legal action and tried to get it reverse but were unsuccessful. My grandfather ended up living in the home of a lady who cared for him rather than a nursing home and she was able to provide good respectful, homey care for him until he died. He actually left everything of what little he had left to her in his will. He died when I was 22, and I was pregnant with my 3rd child and approximately 10 days past my due date. Since they funeral was 200 miles away I was forbidden to attend, and my daughter was born on the night of his funeral. That was in 1983. I’m not sure what happened with the house over the years, I am going to be doing some research over the next few months to find out. What I have learned to this point is that the house sold for less than $6000. 00 about a year ago. It is valued at about $40,000, which is average for that neighborhood. The annual taxes are $140.00 YES, one hundred forty dollars. While I was doing my nostalgia tour I decided to take a cruise by and see how it is looking now. I haven’t been there in now over 28 years so I set my GPS and headed in. Surprisingly many things looked much the same. The VA hospital my grandfather work at as an occupational therapist is still there. The neighborhood is in a bad decline. Many businesses are closed. Clearly the recession has hit and hard in this small town that was quite reliant on manufacturing jobs that have left the country. Lots of buildings were boarded up. Many houses were in disrepair. When I turned onto my Grandfathers street, it looked much the same as when I was a child, a little darker and over grown and slightly run down. My grand fathers house looked a lot different. The old grey (I think they were some kind of asphalt shingle) was gone and resided in white vinyl siding and had a newer roof. The house was clearly unoccupied and had broken windows. The garage looked as if a good wind would blow it down and it also had broken windows. The large dog house in the back also was tumbling down. The yard was over grown with weeds. It was sad and unrecognizable. Everything in my heart wants to buy this house and restore the house and yard. Everyone who I say this to says WHY? and What in the world would you do with it? Why? – I guess to restore the place that gave me that sense of safety and security, because I am once again at a place in my life where everything is up in the air and there is no sense and no solid ground. I know realistically I wouldn’t live in it. It is hours away from where I reside , away from kids, family, job etc. and in a town that is declining. What would I do with it? Keep it like a secret hideaway clubhouse like a little kid? rent it out? I don’t know. A couple of weeks ago I went on a road trip. I visited family and I went on a Nostalgia Tour. I grew up in small towns in Indiana. Really small towns. When I was middle school aged I lived way out in the boonies outside a “town” named Lagro. Lagro had no stop lights that I recall. 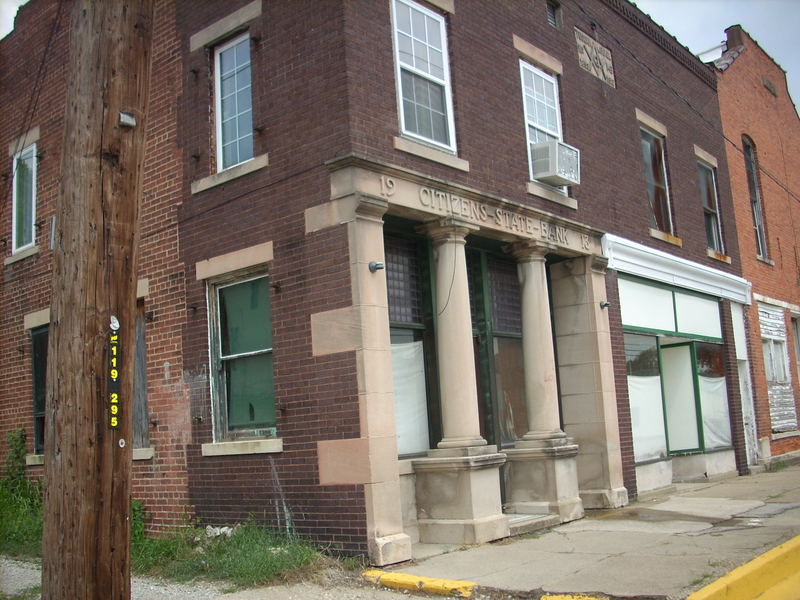 There was a small restaurant, a baitstore/liquor store and a few other small shops and a bank. I was insanely jealous of the kids who lived in “town.” They could walk to each others houses to play tgether in the summer. Walk to the store. Buy penny candy, get a whole BAG for a quarter! “Town” was exciting. I’m really not sure what the population was then but at 0.6 square miles it couldn’t have been many. In 2000 the population was 454, and in 2009 had declined to 416. I decided to take a drive through Lagro on my Nostalgia Tour. 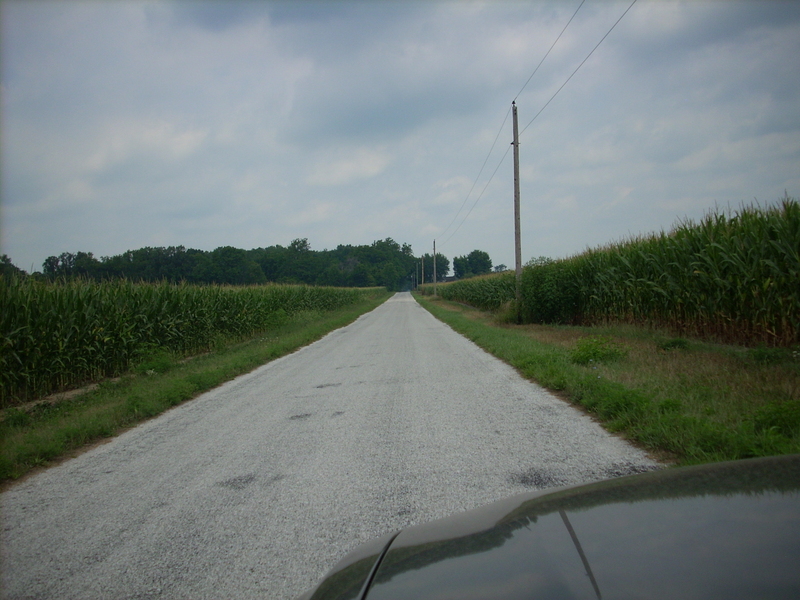 So I set my GPS for Lagro, Indiana, and set out on my adventure. On the road to Lagro. When I pulled into town I stopped to get out of my car and looked around. As I looked around I felt a sinking in my stomach and a lump in my throat. The “town” that had seemed so exciting when I was a child now looked like a ghost town. The cafe is still there, it was open, but empty. The baitshop/liquor store was there and open. Every other business on the main street area was boarded up and empty. There was not a single human being moving on the street. No cars moving. No signs of life. It could have been a set in a Stephen King movie. I felt overwhelmingly sad, a heaviness in my chest. I felt that I had lost something special to me. Looking through a camera lens distances me from the place I am in. It depersonalizes and puts a barrier between me and reality. So I took out my camera and snapped a few pictures, so I could look at them objectively and with out the same emotions I was feeling looking at it in person. Then I got in my car and left. I don’t think I will ever go back again.